Out in the middle of a swamp, a hunter is aiming his rifle at a flying manta. As he prepares to fire, a shuriken suddenly flies out of nowhere and sticks into the side of his rifle. The hunter looks to some nearby rocks on the shore and spots a cloaked figure wearing a woven Japanese hat. Looking through his binoculars, the hunter glimpses the figure taunting him with a handful of shuriken and throwing knives. 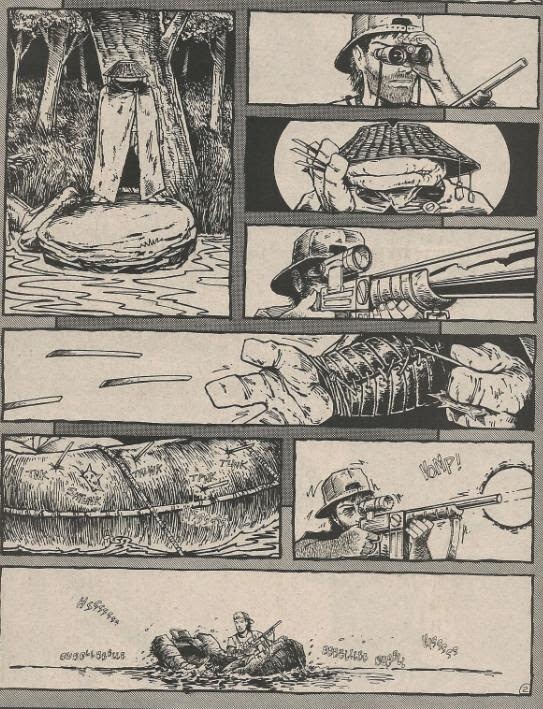 As the hunter fires his rifle, the figure hurls his knives at the raft, deflating it. Sinking, the hunter pulls his busted raft to shore near the rocks where he spotted the figure. There is a huge hole in the rocks from where his shot connected, but no body to be found. Frustrated, the hunter kicks his busted raft and goes home. From a tree just above the rocks, the figure sits watching with amusement. He reveals himself to be an elderly, one-eyed Raphael. Raph reaches into his cloak and releases the flying manta that he’d been protecting. *This story takes place in the “future” portion of the Mirage timeline. *Raph’s future life in the swamp will be seen again in “A Christmas Carol” originally published in the 2nd printing of Michaelangelo (microseries) #1. 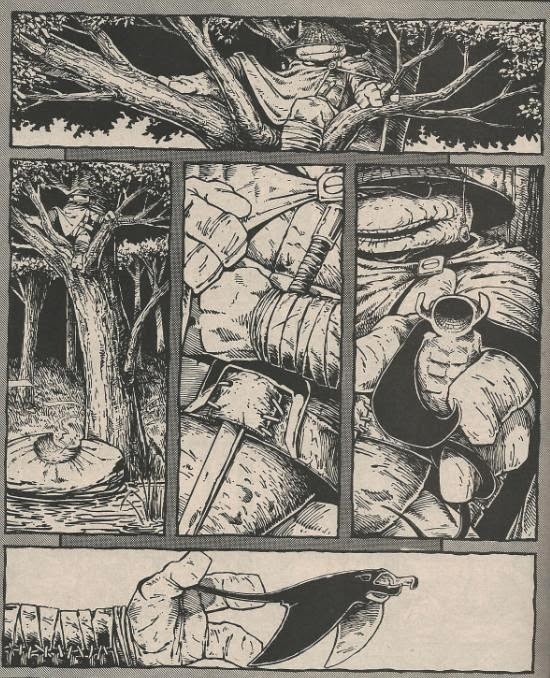 How he lost his eye will be revealed in Tales of the TMNT (Vol. 2) #69. *This issue also featured over a dozen other comics and pin-ups, by various creative bigwigs from the '80s indie comics scene. *The proper designation of story, pencils and inks between Eastman and Laird was not published in the credits, but was revealed in Laird's editorial for TMNT (Vol. 1) #15. And here’s yet another back-up comic strip featuring the Turtles that I’m reviewing because I’m too busy/lazy to get back to doing full issues. “Choices” is another one of those rare back-up strips that I had no idea existed until somebody mentioned it in passing on a forum. I’d like to think I have them all by now, but Mirage pumped out so many of these things across so many indie books during the '80s, tracking them all down can be a bit of a challenge. 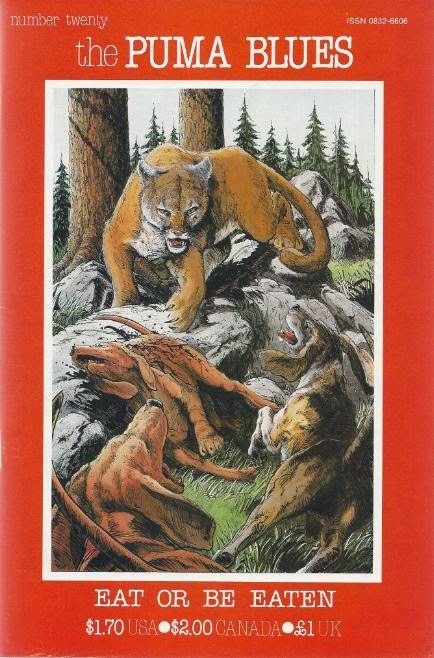 “The Puma Blues” is a comic I’ve heard so much about, but never really took the time to get into. I really don’t know a whole lot about it, other than nearly all the Mirage guys were involved with it in some capacity, it was big into environmentalist messages and flying mantas were everywhere. Eh. It’s on my “to read” list. This issue, though, boasted the one and only TMNT back-up strip to appear in the series and also ranks as one of the earliest glimpses at the “future” era of the Mirage Turtles. Mirage’s future Turtles were always something of a mystery, as for the longest time their stories were relegated only to brief back-up strips with little context other than “something happens to them in the future that’s really depressing”. The second volume of Tales of the TMNT eventually expanded upon these mysteries, offering us full-length stories with the future Turtles, though still keeping the audience in the dark enough to maintain the mystery of what exactly drove them all apart. This strip, though, acts as something of a sequel to “A Christmas Carol”, where we got our first peek at Raph’s future self: a one-eyed loner living in a swamp. How he got there and what happened to his eye, well, we still don’t know. The strip is another silent one, ala “The Road Trip”, telling the story strictly through visuals. Laird and Eastman pull it off, doing a great job of capturing Raph’s attitude strictly through his expressions and actions. Raph’s still a bit of a jackass in the future (as seen in the way he taunts the hunter), but with his soft side still creeping through as he protects a defenseless animal. Not much else to say. It’s just a nice little story with the added bonus of giving us a peek at Mirage’s future Turtles, published at a time when we knew even less about them. Thanks for bringing this one to light! I never knew if there were any TMNT stories in the Puma Blues. It does strike me as a pretty out-there book with a preachy theme. Maybe I'll give it a look sometime. You should look at the Plastron Cafe issues or the "Mirage Mini-Comics" issue (there is a "Forgotten TMNT Adventue" in there) next! I actually already have all of Plastron Cafe and the Mirage Minicomic collection (I've even reviewed the Forgotten TMNT Adventures issue!). Some good stuff in there. I intend to get around to reviewing the TMNT portions of those books (gonna skip the non TMNT stuff since it doesn't pertain to this blog...well, except maybe the Gizmo stuff, but just because I like Gizmo). Dude, I picked up "The Collected Gizmo" graphic novel (published by Mirage) signed by Dooney at my local comic store for the ultra sweet deal price of 3 bucks! Well worth it! Gizmo is a pretty cool character that I wish would show up again. Also, I'm really interested to see a detailed look at the Mini Comic, especially the TMNT story. Where did you review it at? I've seen a copy laying around my local store priced at about 7-8 bucks but have held off buying so far. There were two other TMNT comics in that collection: a Casey Jones-centric one and a comedy piece about an overweight hippo woman with an inflatable Donatello toy. The rest of the comics were unrelated to the TMNT universe, but some were pretty good. Shouldn't this technically be in the Mirage section? Puma Blues was published by Aardvark One International, wasn't it?